Induction of pro-inflammatory factors is one of the characteristics of microglia activation and can be regulated by numerous active components of Chinese traditional herbs. Suppression of pro-inflammatory factors is beneficial to alleviate microglia-mediated cell injury. The present study aims to investigate the effect and possible mechanism of 2,3,4’,5-tetrahydroxystilbene 2-O-β-D-glucoside (TSG) on LPS-mediated induction of pro-inflammatory factors in microglia. Western blot, ELISA, and Hoechst 33258 were used to measure the protein expression, TNF-α/IL-6 content, and apoptotic nuclei, respectively. The mRNA level was measured by real time-PCR. Nitric oxide (NO) content, lactate dehydrogenase (LDH) content, and NF-κB binding activity were assayed by commercial kits. TSG reduced iNOS protein expression as well as TNF-α, IL-6, and NO content in LPS-stimulated BV-2 cells. TSG attenuated the increase in apoptotic nuclei, caspase-3 cleavage, and LDH content induced by BV-2 cell-derived conditioned medium in primary hippocampal neurons. Mechanistic studies showed that TSG reduced the mRNA level of iNOS, TNF-α, and IL-6. TSG failed to suppress IκB-α degradation, NF-κB phosphorylation and nuclear translocation, and ERK1/2, JNK, and p38 phosphorylation. TSG, however, markedly reduced the binding of NF-κB to its DNA element. Chromatin immunoprecipitation (ChIP) assays confirmed that TSG reduced NF-κB binding to the iNOS promoter. 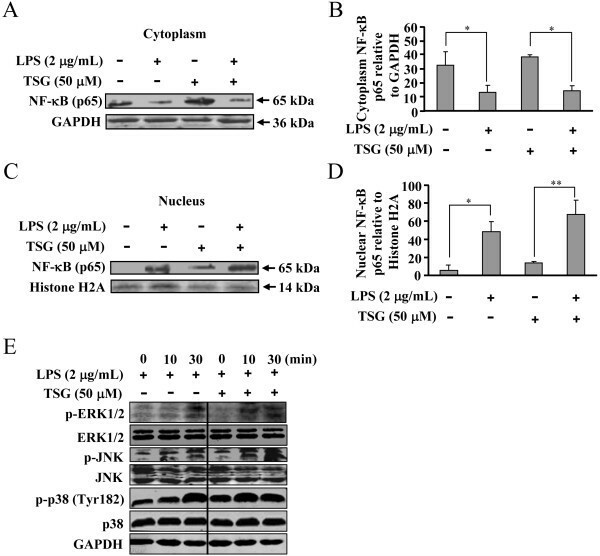 These findings were ascertained in primary microglia where the LPS-induced increase in iNOS expression, NO content, apoptotic nuclei, and NF-κB binding to its DNA element were diminished by TSG. 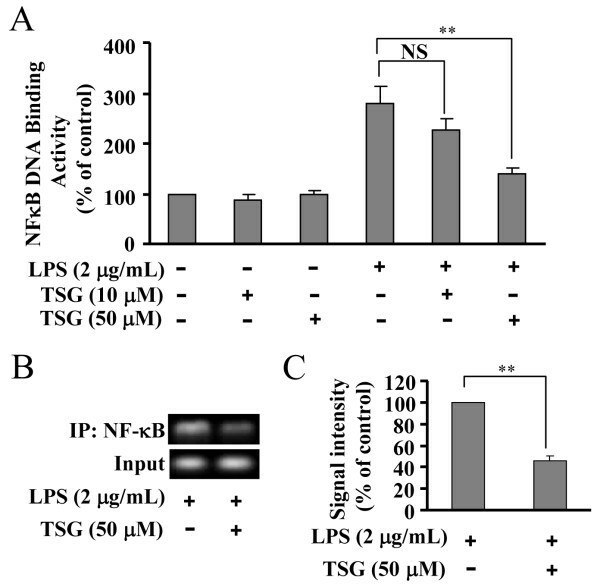 These studies demonstrate that TSG attenuates LPS-mediated induction of pro-inflammatory factors in microglia through reducing the binding activity of NF-κB. This might help us to further understand the pharmacological role of TSG in inflammatory response in the central nervous system. Microglia are the resident immune cells in the central nervous system (CNS). They serve as the neuron-pathological sensor under various conditions such as inflammation [1, 2]. The sensing of microglia to pathological stimuli leads to activation of microglia, which then produce trophic factors that are important for neuronal recovery . However, uncontrolled activation of microglia triggers neurotoxicity by overproducing cytokines such as nitric oxide (NO), TNF-α, and IL-6 [4–6]. NO is synthesized by a family of NO synthase (NOS) consisting of three isoforms: endothelial NOS (eNOS), neuronal NOS (nNOS), and inducible NOS (iNOS) . NO generated from eNOS and nNOS primarily participates in cardiovascular regulation, neuronal signaling transduction, and neuronal protection [8–10]. NO produced from iNOS , however, promotes the development of neurodegenerative disorders associated with inflammation such as Parkinson’s disease and multiple sclerosis [12, 13]. Similarly, TNF-α and IL-6 also have dual functions. For example, TNF-α preconditioning was found to protect neurons from Aβ-mediated cell toxicity . IL-6 treatment ameliorates trimethyltin-induced injury in neurons . Both TNF-α and IL-6 were confirmed to enhance neurotoxicity [5, 6]. Collectively, control of induction of cellular cytokines in microglia might be important for regulation of numerous physiological or pathological processes. An important feature of pro-inflammatory factors is their absence in quiescent inflammatory cells and induction by inflammatory inducers. Lipopolysaccharide (LPS) is an extensively characterized inducer of pro-inflammatory factors . It stimulates gene transcription of pro-inflammatory factors through the classical inhibitor of κB kinase (IKK)-inhibitor of κB α (IκB-α)-nuclear factor κB (NF-κB) signaling pathway. LPS binds with the Toll-like receptors leading to IκB-α degradation through the ubiquitin-proteasome system . The removal of IκB-α liberates transcriptional factor NF-κB. The active NF-κB is then free for translocation to the nucleus, where it initiates gene transcription . Besides IκB-α-NF-κB signals, mitogen-activated protein kinase (MAPK) including ERK1/2, p38, and JNK is also involved in induction of pro-inflammatory factors [18–20]. Interfering with the MAPK signals is beneficial to coping with inflammation. Plenty of small molecules extracted from traditional Chinese herbal medicines have been reported to regulate induction of pro-inflammatory factors through the classical IκB-α-NF-κB pathway. For instance, oregonin was found to inhibit iNOS gene transcription by reducing the nuclear translocation of NF-κB in LPS-stimulated microglia ; curcumin suppresses the expression of NF-κB-dependent genes in rats . A monomer of stilbene from a traditional Chinese herbal medicine polygonummultiflorum, 2,3,4’ ,5-tetrahydroxystilbene 2-O-β-D-glucoside (TSG), has also been found to attenuate inflammatory responses . Its anti-inflammatory function was supported by the following evidence: 1) TSG suppresses COX-2 expression in a carrageenin-induced rat paw edema model ; 2) TSG reduces NO levels in serum and the aorta in atherosclerotic rats ; and 3) TSG decreases iNOS expression and infarct volume in the ischemic brain . In the third case, the effect of TSG was explained by the suppression of NF-κB nuclear translocation in neurons but not in microglia . In the present study, in view of the great importance of microglia in CNS disorders associated with inflammation [27, 28], we explored the effect and mechanism of TSG on LPS-mediated inflammatory response in microglia. We found that TSG reduces iNOS expression and NO, TNF-α, and IL-6 release in microglia in a way that is independent of MAPK-IκB-α-NF-κB activation but likely represses NF-κB binding activity. DMEM/F12 was obtained from Gibco Invitrogen Corporation (Carlsbad, CA, USA). Heat-inactivated FBS was purchased from Hyclone (Logan, UT, USA). TSG was the product of the National Institute for the Control of Pharmaceutical and Biological Products (Beijing, China). LPS, poly-L-lysine, and Hoechst 33258 were purchased from Sigma (Saint Louis, MO, USA). Antibodies against iNOS, IκB-α, p-NF-κB, NF-κB, Histone H2A, ERK1/2, phospho-ERK1/2, and glyceraldehyde-3-phosphate dehydrogenase (GAPDH) were purchased from Cell Signaling Technology (Beverly, MA, USA). Protein A/G PLUS-Agarose and antibodies against caspase-3, p38, phospho-p38, JNK, and phospho-JNK were the products of Santa Cruz Biotechnology (Santa Cruz, CA, USA). Other related agents were purchased from commercial suppliers. All drugs were prepared as stock solutions, and stock solutions were stored at -20°C. BV-2 cells were grown in DMEM/F12 with 10% FBS. The use of mice was approved by the University Animal Ethics Committee of Nantong University (Permit Number: 2110836). Mouse primary cultured brain cells were prepared as described previously with some modifications . Briefly, newborn (day 0 to 1) C57/BL6 mice were decapitated, hippocampus were then removed and digested with 0.125% trypsin for 15 minutes at 37°C. Followed by trituration and centrifugation at 118 g for 6 minutes, cells were re-suspended and plated on poly-L-lysine (1 mg/mL)-coated culture flasks. For preparation of hippocampal neurons, the single-cell suspension was cultured in DMEM/F12 supplement with 2% B27 and 1% penicillin-streptomycin (100 U/mL), and the medium was replaced every 3 days. For preparation of primary microglia, the individual cell suspensions were cultured in DMEM/F12 supplement with 10% FBS and 1% penicillin-streptomycin (100 U/mL). This medium was replaced every 3 days. After 12 days, mixed cells were shaken gently overnight (37°C, 18 h), and the supernatants were collected and plated on the new poly-L-lysine-coated culture flasks. All cells were maintained in a 37°C incubator containing 95% air and 5% CO2. Cell viability was measured using MTT Cell Proliferation and Cytotoxicity Assay Kit (Bi Yuntian Biological Technology Institution, Shanghai, China). Briefly, methylthiazolyldiphenyl-tetrazolium bromide (5 mg/mL) was dissolved in prepared MTT-dissolved solutions and kept at -20°C. After washing with PBS, the cells in plates were added 20 μL of MTT solutions and kept at 37°C for 4 h. The blue crystals were dissolved in formazan-dissolved solutions. The absorbance was read at 570 nm. To extract the total proteins, cells were lysed on ice for 30 minutes in lyses buffer (50 mM Tris–HCl, pH 7.4, 1 mM EDTA, 100 mM NaCl, 20 mM NaF, 3 mM Na3VO4, 1 mM PMSF with 1% (v/v) Nonidet P-40, and protease inhibitor cocktail). The lysates were centrifuged at 12,000 g for 16 minutes, and the supernatants were harvested. After denaturation, 30 μg of protein was separated on 10% SDS/PAGE gels and then transferred to nitrocellulose membranes (Bio-Rad, Hercules, CA, USA). After blocking with 5% nonfat dried milk powder/Tris-buffered saline Tween-20 (TBST) for 1 h, membranes were probed with 1:500 primary antibodies against iNOS, caspase-3, IκB-α, p-NF-κB, NF-κB, ERK1/2, p-ERK1/2, JNK, p-JNK, p38, p-p38, and Histone H2A or 1:10,000 primary antibody against GAPDH overnight at 4°C. Primary antibodies were then removed by washing the membranes three times in TBST. Membranes were further incubated for 2 h at room temperature with IRDye 680-labeled secondary antibodies (1:3,000 to 1:5,000). Finally immunoblots were visualized by scanning using the Odyssey CLx western blot detection system. Isolated cytoplasmic and nuclear proteins were normalized to GAPDH and Histone-H2A respectively. The band density was quantified using Image J software. At the end of each treatment, total RNA was isolated from BV-2 cells using the RNeasy mini kit according to the manufacturer’s instructions (Qiagen, GmbH, Hilden, Germany). First-strand cDNA was generated by reverse transcription of total RNA using the RT system (Promega, Madison, WI, USA). Real-time PCR reactions were conducted with FaststartSYBR Green Master Mix (Roche Molecular Biochemicals, Shanghai, China). Briefly, 2 μL of diluted cDNA, 0.5 μM primers, 2 mM MgCl2, and 1 × FastStartSYBR Green Master mix were employed. The primers are quoted as follows [30, 31]: iNOS 5’-CTC ACT GGGACAGCA CAG AA-3’ (forward), 5’-TGG TCA AAC TCT TGG GGT TC-3’ (reverse); TNF-α 5’-CTG TGA AGG GAA TGG GTG TT-3’ (forward), 5’-GGT CAC TGT CCC AGC ATC TT-3’ (reverse); IL-6 5’-TTC CAT CCA GTT GCC TTC TT-3’ (forward), 5’-CAG AAT TGC CAT TGC ACA AC-3’ (reverse); 18S rRNA 5’-GTA ACCCGTTGAACC CCA TT-3’ (forward), 5’-CCA TCCAATCGG TAG TAG CG-3’ (reverse). PCR products were detected by monitoring the fluorescence increase of double-stranded DNA-binding dye SYBR Green during amplification. The expression levels of target genes were normalized to the housekeeping gene (18S rRNA). The fold changes in the target gene expression between experimental groups were expressed as a ratio. Relative gene expression was calculated by the comparative cycle threshold (Ct) method. Melt-curve analysis and agarose gel electrophoresis were used to examine the authenticity of the PCR products. Total nitrite levels in collected supernatants were measured with a Griess reagent kit (Invitrogen). The reaction consisted of 20 μL of Griess Reagent, 150 μL of supernatant, and 130 μL of de-ionized water. After incubation of the mixture for 30 minutes at room temperature, nitrite levels were measured at 548 nm using an M2 spectrophotometric microplate reader (Molecular Devices). For LDH testing, hippocampal neurons were seeded into 24-well plates. BV-2 cells were treated with LPS (2 μg/mL) for 24 h, and then the supernatants were collected to incubate hippocampal neurons. After additional 48 h, the supernatants from hippocampal neurons were collected to be prepared for further experiments. LDH levels were determined using LDH Cytotoxicity Assay Kit according to the supplier’s recommendation (Bi Yuntian Biological Technology Institution, Shanghai, China). For Hoechst 33258 staining, hippocampal neurons in different groups were fixed with 2% paraformaldehyde in 0.01 M PBS (pH 7.4) for 20 minutes, and then rinsed three times with PBS for 10 minutes each. Cells were treated with Hoechst 33258 staining solution for 15 minutes at 4°C. The images of Hoechst 33258 staining were viewed with a Nikon Eclipse 800 microscope. Cells with condensed bright nuclei were regarded as apoptotic cells. The apoptosis rate was calculated by the ratio between the numbers of cells with condensed bright nuclei and total cell numbers. The numbers of apoptotic or total cells were counted from the resulting four phases for each point with the digital camera and microscope, and then averaged for each experimental condition. The data presented were generated from three separate assays. The nuclei were extracted from BV-2 cells or primary microglia by first incubating them in hypotonic buffer (10 mM Tris–HCl, pH 7.5, 10 mM NaCl, 1.5 mM MgCl2) at 4°C for 15 minutes. After homogenization, cell homogenates were spun at 3,000 g for 5 minutes. The supernatants were collected for western blot analysis. The pellets were recovered, extensively washed, and re-suspended in the nuclear extraction buffer (50 mM Tris–HCl, pH 7.4, 150 mM NaCl, 1% Nonidet P-40, 0.25% sodium deoxycholate, 10% glycerol, 50 mM NaF, 1 mM Na3VO4, 5 mM sodium pyrophosphate, protease inhibitors). The NF-κB binding activity of nuclear extracts was measured with the TransFactor NF-κB colorimetric kit (Clontech, Mountain View, CA, USA) according to the manufacturer’s instruction. The ChIP experiment was performed as described previously with some modifications . Briefly, BV-2 cells were treated with LPS (2 μg/mL) for 1 h in the presence and absence of TSG. 1% of formaldehyde was added to the culture medium, and after incubation on the rocker for 10 minutes at room temperature, cells were rinsed twice with PBS and lysed for 15 minutes at 4°C. After sonication, the lysate was used as DNA input control. The remaining lysates were diluted 10-fold with ChIP dilution buffer followed by incubation with NF-κB p65 antibody overnight at 4°C. Immunoprecipitated complexes were collected using protein A/G Plus-agarose beads. The precipitates were extensively washed and then incubated in the elution buffer containing 1% SDS and 0.1 M NaHCO3 at room temperature for 20 minutes. Cross-linking of protein-DNA complexes was reversed at 65°C for 4 h. DNA was extracted with the QiagenPCR purification kit. For ChIP assays, we used the following primers (forward) 5’-CAAGCCAGGGTATGTGGTTT-3’ and (reverse) 5’-GCAGCAGCCATCAGGTATTT-3’ to get a fragment at 290-bp. The resulting product was separated by 2% agarose gel electrophoresis. Data are expressed as means ± standard error (SE). One-way analysis of variance (ANOVA) followed by the post hoc test was used for the statistical analysis, employing SPSS 11.0 software. Differences were considered significant at P < 0.05. To determine the working concentration and effective period of TSG for induction of pro-inflammatory factors, we first investigated the dose- and time-dependent effects of TSG on iNOS expression in BV-2 cells. BV-2 cells were pretreated with TSG for 30 minutes at concentrations range at 1 to 50 μM when 2 μg/mL of LPS was applied to induce iNOS expression. As shown in Figure 1A and 1B, TSG significantly reduced the increase in iNOS expression in LPS-stimulated (2 μg/mL, 24 h) BV-2 cells. Peak inhibition was observed at the concentration of 50 μM. For this reason, 50 μM of TSG was selected for the following experiments. A time-dependent response curve showed that pretreatment of BV-2 cells with TSG (50 μM, 30 minutes) markedly inhibited the increase in iNOS expression at the time points of 16 and 24 h (Figure 1C and D). The cell viability of BV-2 cells was not affected by TSG administration at 1 to 100 μM (Figure 1E). Consistent with the effect on iNOS expression, production of NO was also decreased by TSG treatment (50 μM, 30 minutes) in LPS-stimulated BV-2 cells: the content of NO was decreased from 22.93 ± 0.19 to 14.89 ± 1.16 (n = 6, P < 0.05 versus the LPS alone-treated group, Figure 2A). Finally, we observed a considerable reduction in TNF-α (from 286.65 ± 38.55 to 100.54 ± 13.42, n = 6, P < 0.05 versus the LPS alone-treated group) and IL-6 (from 4763.40 ± 529.09 to 2479.38 ± 706.54, n = 6, P < 0.01 versus the LPS alone-treated group) content after TSG treatment (50 μM, 30 minutes) in LPS-stimulated BV-2 cells (Figure 2B and C). Effects of TSG on induction of inducible nitric oxide (iNOS) protein in BV-2 cells stimulated with lipolysaccharide (LPS). (A) Representative images showing that TSG pretreatment (30 minutes) inhibited iNOS expression in LPS-stimulated BV-2 cells at different concentrations (1, 10, 30, 50 μM). (B) Quantitative analysis of iNOS expression in cells upon LPS/TSG treatment (*P < 0.05 versus control). (C) Representative images showing the time-dependent effect of TSG on iNOS expression in LPS-stimulated BV-2 cells. (D) A time-course analysis of iNOS expression upon TSG incubation (*P < 0.05, **P < 0.01 versus control). (E) Quantitative analysis of the cell viability after TSG treatment at concentrations ranging from 1 to 50 μM (n = 6). All data were shown as mean ± standard error. Experiments were performed three times independently. NS, no significance; GAPDH, glyceraldehyde-3-phosphate dehydrogenase. 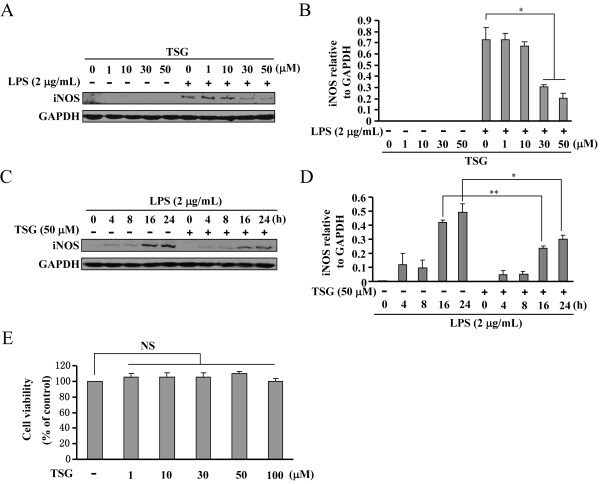 Effects of TSG on release of nitric oxide (NO), TNF-α, and IL-6 in BV-2 cells stimulated with lipolysaccharide (LPS). Quantitative analysis of NO (A), TNF-α (B), and IL-6 (C) content after TSG treatment (50 μM, 30 minutes) in LPS-stimulated BV-2 cells (n = 6, **P < 0.01 versus control; *P < 0.05 or **P < 0.01 versus the LPS alone-treated group). NS, no significance. All data were shown as mean ± standard error. To further investigate whether the TSG-mediated suppression of pro-inflammatory factors in BV-2 cells has protective roles in neuronal damage, primary hippocampal neurons were incubated with BV-2 cell-derived conditioned medium in the absence or presence of TSG. We found that without TSG treatment, the conditioned medium induced a marked increase in apoptotic nuclei percentage (Figure 3A and B), cleaved caspase-3 level (Figure 3C and D), and LDH content in primary hippocampal neurons (Figure 3E). After TSG treatment (50 μM, 48 h), the percentage of apoptotic nuclei, the level of cleaved caspase-3, and the content of LDH were decreased from 251.17 ± 26.59%, 2.57 ± 0.43, and 5801.10 ± 631.62 in LPS-stimulated cells to 142.91 ± 20.33% (n = 5, P < 0.05 versus the LPS alone-treated group), 1.81 ± 0.16 (n = 3, P < 0.05 versus the LPS alone-treated group), and 3839.26 ± 906.27 (n = 6, P < 0.05 versus the LPS alone-treated group) in LPS/TSG co-treated cells, respectively. These results suggest that inhibition of induction of pro-inflammatory factors by TSG might contribute to the amelioration of neuronal injury induced by microglia-conditioned medium. Role of TSG in injury of hippocampal neurons induced by BV-2 cell-derived conditioned medium. (A) Pretreatment with TSG (30 minutes, 50 μM) inhibited the increase in apoptotic nuclei in primary hippocampal neurons stimulated with BV-2 cell-derived conditioned medium. (B) Quantitative analysis of apoptotic nuclei percentage in neurons (n = 5, **P < 0.01 versus control; *P < 0.05 versus the lipopolysaccharide (LPS) alone-treated group). (C) Representative images showing that TSG pretreatment (50 μM, 30 minutes) reduced the cleavage of caspase-3 in primary hippocampal neurons stimulated with BV-2 cell-derived conditioned medium. (D) Quantitative analysis of cleaved caspase-3 in neurons (n = 3, *P < 0.05 versus control or the LPS alone-treated group). (E) Quantitative analysis of lactate dehydrogenase (LDH) content in LPS/TSG-treated hippocampal neurons (n = 6, **P < 0.01 versus control; *P < 0.05 versus the LPS alone-treated group). All data were shown as mean ± standard error. NS, no significance; GAPDH, glyceraldehyde-3-phosphate dehydrogenase. The reduction of pro-inflammatory factors protein could be due to the suppression of either gene transcription or protein translation. In order to differentiate between the two possibilities, we detected the mRNA level of iNOS, TNF-α, and IL-6 in LPS (2 μg/mL, 24 h)-stimulated BV-2 cells in the absence or presence of TSG by real time-PCR. As shown in Figure 4, LPS induced a robust increase in iNOS, TNF-α, and IL-6 mRNA level. Pre-treatment of cells with TSG (50 μM, 30 minutes) significantly decreased the mRNA level of iNOS (from 8.94 ± 1.06 to 3.83 ± 0.85, n = 3, P < 0.05 versus the LPS alone-treated group), TNF-α (from 6.66 ± 0.84 to 2.96 ± 0.33, n = 3, P < 0.05 versus the LPS alone-treated group), and IL-6 (from 9.95 ± 1.62 to 4.58 ± 0.65, n = 3, P < 0.05 versus the LPS alone-treated group) in LPS-stimulated cells (Figure 4). These data suggest that TSG exerts its inhibitory function likely by reducing gene transcription of pro-inflammatory factors in BV-2 cells. Role of TSG in mRNA formation of pro-inflammatory factors in BV-2 cells. 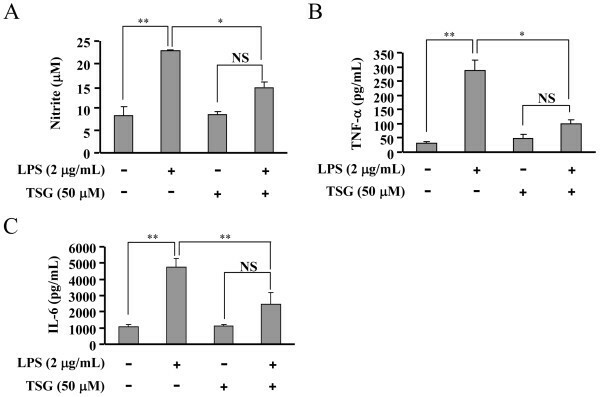 Quantitative analysis of the mRNA level of inducible nitric oxide (iNOS) (A), TNF-α (B), and IL-6 (C) in cells upon lipolysaccharide (LPS) with or without TSG pretreatment (30 minutes, 50 μM, n = 3, **P < 0.01 versus control; *P < 0.05 versus the LPS alone-treated group). NS, no significance. All data were shown as mean ± standard error. The IKK-IκB-α-NF-κB signaling pathway is widely accepted to mediate the induction of pro-inflammatory factors in inflammation . Therefore, to explore the mechanism underlying the effect of TSG on gene transcription of pro-inflammatory factors, we measured the change in degradation of IκB-α after TSG treatment in LPS-stimulated BV-2 cells. As shown in Figure 5A and 5B, LPS resulted in a dramatic increase in IκB-α degradation at the time point of 10 minutes, and TSG pretreatment (50 μM, 30 minutes) did not alter this degradation. It has been reported that the full activity of NF-κB needs the increase of NF-κB phosphorylation. We therefore determined whether TSG affects the LPS-triggered NF-κB phosphorylation in BV-2 cells. 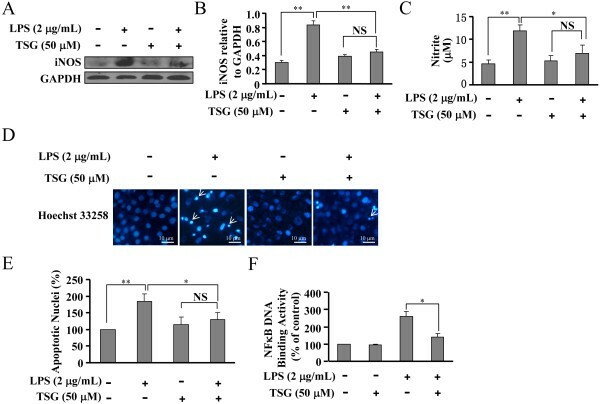 In accordance with the influence of TSG in IκB-α degradation, TSG treatment (50 μM) failed to reduce the increase in the phosphorylation level of NF-κB p65 at Ser536 in LPS-stimulated BV-2 cells (Figure 5C and D). To initiate gene transcription, active NF-κB must enter nuclei. To investigate whether TSG treatment could influence the nuclear transport of NF-κB, we analyzed the change in NF-κB level in the cytoplasm and nucleus in BV-2 cells stimulated with LPS. As shown in Figure 6A, B, C, and D, NF-κB p65 was present predominantly in the cytoplasm in un-stimulated cells. LPS incubation resulted in NF-κB nuclear translocation, but this translocation was not affected by TSG pretreatment (50 μM, 30 minutes) (Figure 6A, B, C, and D). Because IκB-α degradation and NF-κB activation are reported to be mediated by MAPK signals [18–20], we then checked the influence of TSG in MAPK activation including the phosphorylation of ERK1/2, JNK, and p38. We found that TSG did not suppress the increase in the phosphorylation level of ERK1/2, JNK, and p38 in LPS-stimulated BV-2 cells (Figure 6E). Taken together, our findings indicate that the effect of TSG on induction of pro-inflammatory factors in BV-2 cells was not due to the inhibition of MAPK-IκB-α-NF-κB signals. Effects of TSG on lipopolysaccharide (LPS)-initiated inhibitor of κB α (IκB-α) degradation and nuclear factor κB (NF-κB) phosphorylation in BV-2 cells. (A) LPS-induced IκB-α degradation was not altered in TSG (50 μM, 30 minutes)-incubated BV-2 cells. (B) Quantitative analysis of the effect of TSG on IκB-α degradation in LPS-treated cells (n = 3, *P < 0.05 versus control). (C) LPS-induced NF-κB phosphorylation was also not changed by TSG treatment (50 μM, 30 minutes). (D) Quantitative analysis of the effect of TSG on NF-κB phosphorylation level in LPS-treated cells (n = 3, *P < 0.05 versus control). All data were shown as mean ± standard error. GAPDH, glyceraldehyde-3-phosphate dehydrogenase. Effects of TSG on the nuclear translocation of nuclear factor κB (NF-κB) and activation of mitogen-activated protein kinase (MAPK) signals in BV-2 cells. (A) Effects of TSG on NF-κB expression in the cytoplasm in lipolysaccharide (LPS)/TSG-treated BV-2 cells. (B) Quantitative analysis of NF-κB amount in the cytoplasm (n = 3, *P < 0.05 versus control or the TSG alone-treated group). (C) Effects of TSG on NF-κB expression in the nucleus in LPS/TSG-treated BV-2 cells. (D) Quantitative analysis of the amount of NF-κB in the nucleus (n = 3, *P < 0.05 versus control, **P < 0.01 versus the TSG alone-treated group). (E) Representative images showing the effect of TSG (50 μM, 30 minutes) on LPS-induced increase in ERK1/2, JNK, and p38 phosphorylation level in BV-2 cells. Experiments were performed three times independently. All data were shown as mean ± standard error. GAPDH, glyceraldehyde-3-phosphate dehydrogenase. As TSG did not appear to affect MAPK-IκB-α-NF-κB activation, we then tested a possibility that TSG might inhibit pro-inflammatory factor transcription by directly interfering with NF-κB binding to its DNA element. To explore this possibility, BV-2 cells were stimulated with LPS to activate NF-κB. Binding of active NF-κB with labeled DNA oliogos corresponding to its promoter was monitored in the absence or presence of TSG. As shown in Figure 7A, LPS induced a dramatic increase in NF-κB binding activity in nuclei. This effect was abolished by TSG in a dose-dependent manner. To further confirm this effect, we performed ChIP assays on the iNOS promoter in stimulated cells with or without pretreatment with TSG (50 μM). As shown in Figure 7B and 7C, LPS-elicited NF-κB binding to the iNOS promoter was significantly reduced by TSG pretreatment (50 μM, 30 minutes). These data indicate that TSG primarily interferes with binding of NF-κB to its DNA element in BV-2 microglia. TSG attenuates the binding of nuclear factor-κB (NF-κB) to its DNA element in BV-2 cells. (A) Quantitative analysis of the effect of TSG on the binding of NF-κB to its DNA element in BV-2 cells (n = 5, **P < 0.01 versus the lipolysaccharide (LPS) alone-treated group). (B) ChIP assays showed that TSG treatment (50 μM, 30 minutes) markedly reduced the binding of NF-κB to the inducible nitric oxide (iNOS) promoter in LPS-treated cells. The chromatin was immunoprecipitated by using the anti-NF-κB p65 antibody. (C) Quantitative analysis of the effect of TSG on the binding of NF-κB to the iNOS promoter in BV-2 cells (n = 3, **P < 0.01 versus control). NS, no significance. All data were shown as mean ± standard error. Finally, we performed experiments to ascertain whether the major findings in BV-2 cells also occur in primary microglia. As expected, pretreatment of primary microglia with TSG (50 μM, 30 minutes) reduced the iNOS expression (Figure 8A and B). Similar to what was observed in BV-2 cells, NO production in LPS-stimulated primary microglia was also reduced by TSG treatment (50 μM, 30 minutes) (Figure 8C). Consequently, TSG reduced the percentage of apoptotic nuclei in hippocampal neurons injured by primary microglia-derived conditioned medium (Figure 8D and E). Moreover, we observed an inhibitory effect of TSG on the binding of NF-κB to its DNA element in the nucleus in LPS-stimulated primary microglia (Figure 8F). Collectively, these data demonstrate that TSG attenuates the inflammatory response in primary microglia by suppressing the DNA binding activity of NF-κB. 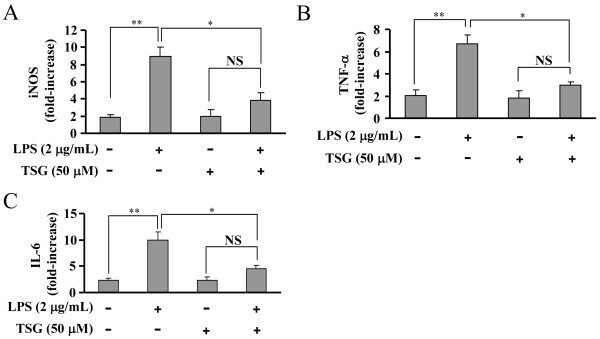 TSG reduces the induction of inducible nitric oxide (iNOS) in lipolysaccharide (LPS)-stimulated primary microglia and protects the hippocampal neurons from primary microglia conditioned medium-induced cell injury. (A) Representative images showing that TSG treatment (30 minutes, 50 μM) inhibited iNOS expression in primary microglia. (B) Quantitative analysis of the iNOS expression in primary microglia in LPS/TSG-treated cells (n = 5, **P < 0.01 versus control or the LPS alone-treated group). (C) Quantitative analysis of NO content in LPS/TSG-treated cells (n = 5, **P < 0.01 versus control; *P < 0.05 versus the LPS alone-treated group). (D) TSG treatment (30 minutes, 50 μM) inhibited the increase in apoptotic nuclei in hippocampal neurons induced by primary microglia-derived conditioned medium. (E) Quantitative analysis of apoptotic nuclei in LPS/TSG-treated cells (n = 5, **P < 0.01 versus control; *P < 0.05 versus the LPS alone-treated group). (F) Quantitative analysis showing that the LPS-induced increase in the binding of nuclear factor -κB (NF-κB) to its DNA element in primary microglia was attenuated by TSG treatment at the concentrations of 10 and 50 μM (n = 5, *P < 0.05 versus the LPS alone-treated group). NS, no significance; GAPDH, glyceraldehyde-3-phosphate dehydrogenase. All data were shown as mean ± standard error. The endotoxin- or pathogen-mediated induction of pro-inflammatory factors in microglia are implicated in pathophysiological processes of neurotoxicity [33–35]. Numerous anti-oxidative molecules have been shown to protect neurons from cell toxicity in inflammatory disorders by attenuating the production of pro-inflammatory factors such as NO, TNF-α, and IL-6 in microglia [21, 22, 36]. TSG, an active component of the rhizome extract from Polygonummultiflorum, exhibits its function through anti-inflammation , anti-apoptosis , and anti-oxidation . In this study, we found that TSG impairs LPS-mediated inflammatory response in microglia. This effect was exemplified by the decrease in the production of pro-inflammatory factors as well as the DNA binding activity of NF-κB in LPS/TSG-stimulated microglia. This finding underscores the importance of TSG in regulation of inflammation, and extends the role of TSG beyond a cardiovascular protective molecule to a modulator of microglia activation. Recently, interesting work reported that TSG prevents the overexpression of α-synuclein in APPV717I transgenic mice with Alzheimer’s disease (AD), strongly showing a potential role of TSG in prevention or treatment of AD . Together with the fact that microglia are believed to mediate the development of AD [39, 40] and that the damage of neurons in neurodegenerative disorders is usually secondary to microglia activation [41, 42], we believe that our data may provide evidence to clarify how TSG exerts its protective effect in AD. In vivo experiments designed to investigate the role and mechanism of TSG in different neurodegenerative disorders in the CNS are in progress. The functional consequence of microglia activation depends on the induction and release of pro-inflammatory factors. The appropriate amount of pro-inflammatory factor is indispensable for various physiological processes, such as neuronal protection [14, 15] and synaptic plasticity . However, overwhelmingly generated pro-inflammatory factors can act as neurotoxins and cause neuronal injury [5, 6, 43, 44]. Strategies to inhibit the excessive production of pro-inflammatory factors are crucial to attenuate the neurotoxicity induced by inflammatory events. In the present study, we showed that TSG reduces the content of NO, TNF-α, and IL-6, and this reduction protects the hippocampal neurons from microglia-conditioned medium-induced cell injury. This finding about the role of TSG in induction of pro-inflammatory factors in microglia and protection of hippocampal neurons from inflammatory stimulation provides a new insight into the pharmacological role of TSG in inflammatory disorders. Blockade of gene transcription in stimulated inflammatory cells is often due to one or multiple interruptions in the signaling transduction from the stimuli to the corresponding transcriptional cytokines. In LPS signals, the MAPKs-IKK-IκB-α-NF-κB pathway is downstream of LPS signaling transduction [15, 34]. IκB-α is phosphorylated by IKK, which then leads to the degradation of IκB-α and the translocation of NF-κB from the cytoplasm to nucleus. However, we found that although TSG inhibited pro-inflammatory factor gene-transcription in microglia, it failed to affect LPS-induced IκB-α degradation and NF-κB phosphorylation or nuclear translocation. Neither did we observe any significant effect on the LPS-induced increase in ERK1/2, JNK, or the p38 phosphorylation levels. It indicates that TSG might affect the inflammatory response in microglia by a mechanism downstream of the nuclear translocation of NF-κB. In fact, our results showed that the increase in DNA binding activity of NF-κB in LPS-stimulated microglia was remarkably suppressed by TSG. Moreover, the reduction in active NF-κB from binding to the iNOS promoter in the ChIP assay further confirmed the function of TSG. In general, these data provide a plausible explanation why the gene transcription of pro-inflammatory factors is inhibited, despite the fact that activation of MAPK-IκB-α-NF-κB signals is not perturbed in TSG/LPS co-treated cells. However, as we did not check the influence of TSG in the binding of NF-κB to TNF-α and IL-6 promoters, to some extent these conclusions limit our observations for the role of TSG in inflammatory response in microglia. Some previous studies associated with the interaction between NF-κB and TNF-α and IL-6 promoters might give us evidence to offset the limitation. For example, a 120-bp TNF-α promoter was found to possess a binding site for NF-κB , and the promoter region of the IL-6 gene was confirmed to have a putative NF-κB binding site . It is worth noting that our above observations in microglia are inconsistent with the in vitro oxygen glucose deprivation/reperfusion (OGD/R)-stimulated neurons where the TSG-mediated reduction in iNOS expression and brain infarct volume is mediated by the inhibition of nuclear translocation of NF-κB . However, because there are large differences between in vitro and in vivo micro-environments and the damage of neurons in the in vivo conditions usually occurs following excessive activation of microglia, we tend to suppose that the TSG-mediated reduction in infarct volume after brain ischemia might be mediated by the attenuation of inflammatory response in microglia with a mechanism that is different from that in neurons. That is, TSG may protect the brain tissues from ischemia by impairing the DNA binding activity of NF-κB. However, how this mechanism works in microglia is not clear. We notice that though resveratrol, a polyphenolicphytoalexin found in grapes, fruits, and root extracts of the weed Polygonumcuspidatum, has similar characteristics in structure to TSG [48, 49], it exhibits distinct mechanisms in regulation of inflammatory response in microglia. For example, resveratrol was reported to decrease the production of pro-inflammatory factors primarily by impairing the phosphorylation and nuclear translocation of NF-κB [49, 50]. This difference, combined with the highly similar structure of TSG and resveratrol, might help us to further clarify the exact mechanism of TSG in inflammatory response. In summary, this study identifies a role for TSG in the induction of pro-inflammatory factors in microglia by a mechanism that is independent of MAPK activation, IκB-α degradation, and NF-κB phosphorylation/nuclear translocation, but probably relies on the repression of NF-κB binding activity. This work was supported by the National Natural Science Foundation of China to Professor Wei Zhang (No. 81070197) and Dr Chao Huang (No. 81102428) and the Priority Academic Program Development of Jiangsu Higher Education Institutions. CH participated in the design of this study. CH and YW performed the cell culture, western blot, statistical analysis in the whole research. YW carried out the real time-PCR assay. JW carried out the NO assay. WY participated in the design of this study and carried out the LDH and MTT assay. CH carried out Hoechst 33258 staining. XC and WY participated in the design of this study. YW carried out the NF-κB binding and ChIP assays. WZ participated in the design of this study and proofread the whole manuscript. All authors read and approved the final manuscript.